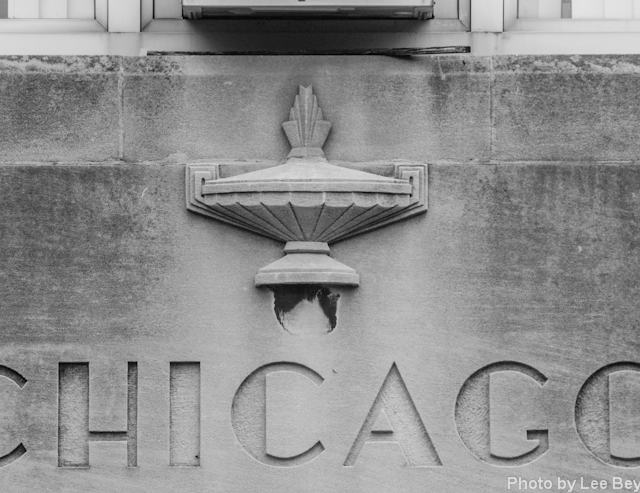 Chicago&apos;s public schools remain one of the most overlooked aspects of the city&apos;s architectural heritage. It&apos;s good to take a closer look now and then. Take the design of Chicago Vocational Career Academy, for instance. 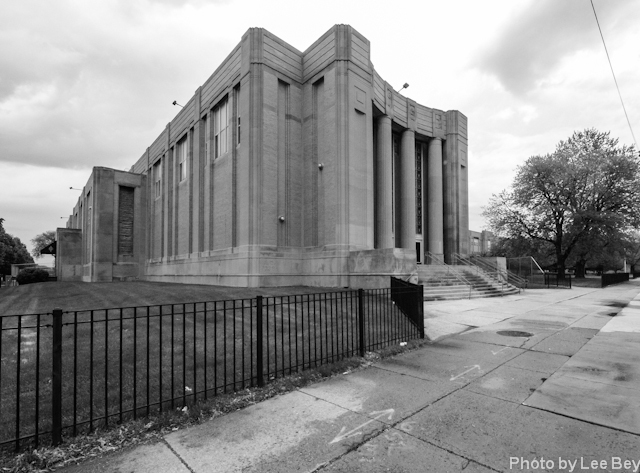 The massive, 72-year-old school, located at 2100 E. 87th St., is not only the city&apos;s second largest high school building (only Lane Tech is bigger), but is Chicago&apos;s best large-scale example of Art Moderne architecture. The 27-acre school, formerly known as Chicago Vocational High School, was built for $3.5 million, with 45 percent of the cash coming from the federal Public Works Administration. The result was a big, robust complex rendered in a blocky, 1930s-modern esthetic. Once you get past the school’s size, there are a host of nicely-done abstract architectural details such as the auditorium’s stately columns seen in the above photo. Or the lamp—part of the school’s crest—above the school’s main entrance in the photo below. And can I give a shout-out to the Broadway typeface used in the school’s name? Quite hip. The style was less than a decade old when the school was designed and would have conveyed newness and modernity at the time. 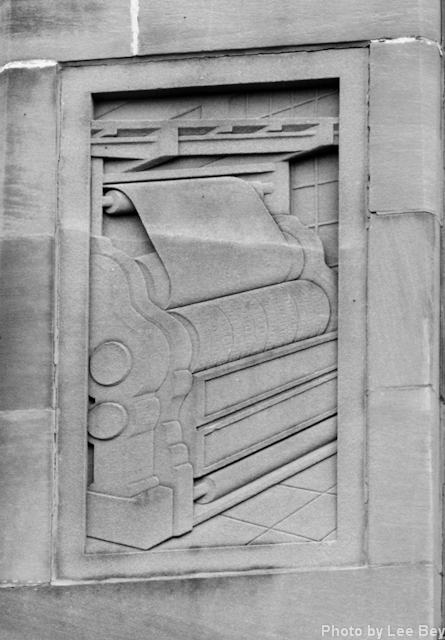 The completion date, etched in stone above the school&apos;s main entrance, boasts a completion date of 1938–which is untrue. 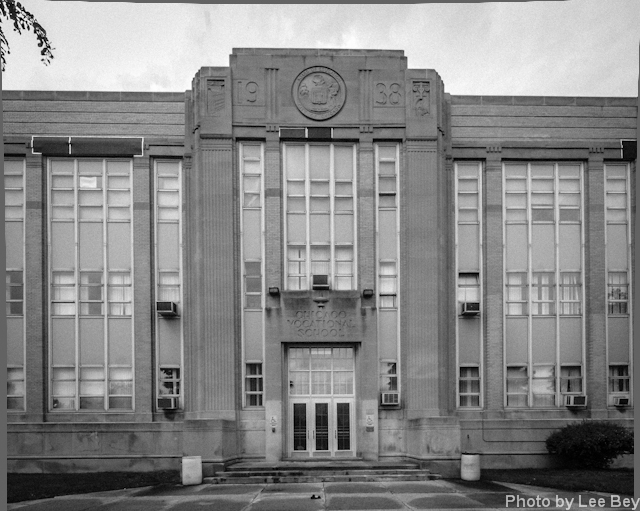 A labor dispute held up construction for two years and the campus opened in August of 1940. Chicago Vocational&apos;s original concept was revolutionary. The school system figured out the world of the 1940s and beyond would need more machinists, auto mechanics, electricians, architectural draftsmen, food service experts, sheet metal workers, complex printing machine operators–and more–so they built a school to fill the need. The school was built for 6,000 students, all male, originally, who would graduate with certificates proving they were work-ready. The school still produced job-ready graduates when I attended there, even if vocational education was increasingly seen–wrongly–as a second-tier educational track. In the decades that followed, the school shrank in prestige, class size and offerings. The building still looks good, although it looks like some limestone needs repair. And the ugly chain-link fences used to close off some of the grounds make the school look more like a prison than a learning institution. But no doubt the edifice still cuts an imposing figure. Chicago Vocational re-opens in the fall as one of the city&apos;s five STEM (Science, Technology, Engineering and Math) academies. The hope is that these six-year schools, with a curriculum and program developed by IBM, Cisco, Microsoft, Motorola Solutions and Verizon, will return the school to its original mission of producing graduates for the workforce. And providing a great piece of architecture in which to learn.